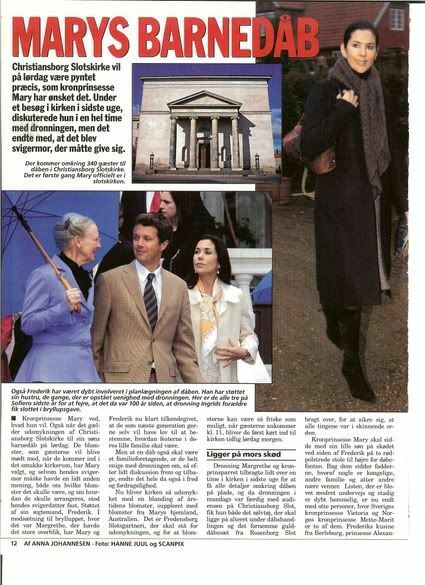 Does anyone here know what kind of relationship does Mary have with Queen Margrethe? From news reports of the christening preparations, pretty contentious at times. I've never heard this. What do you mean? Do you mean that they were at odds during the christening preparations? what happend during the christening preparation? I thought they had a pretty nice relationship. Although in such big events like a christening, we could all get a little tense. Oh for goodness sake will someone please tell us what went on during the christening? Nothing went on during the christening preparations. 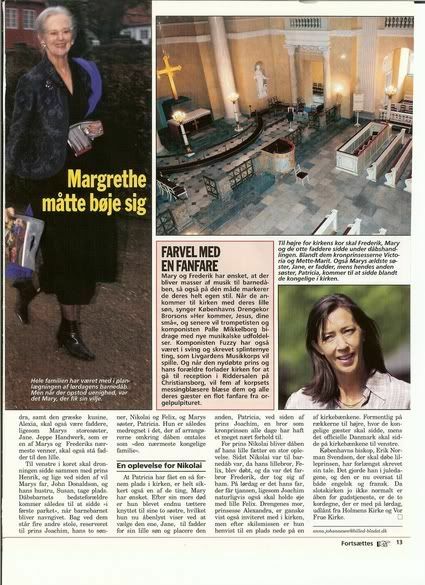 Gossip magazines just made up a story that Margrethe was hurt because it was Mary who prepared the christening and not she herself. I would say they have a good relationship. Mary & Frederik & Christian were with QMII on the balcony at her birthday (and stayed with her for Easter) and they visited her in private when she was in hospital for her knee surgery. And so on. So, I would say they have a very normal family relationship. I totally agree with Ricarda. They seem to have a very nice relationship going on. The Queen seems to be a very down to earth person and a very loving and generous person. I see where there could/would be some tense moments or misunderstandings, it's normal between wives and mothers-in-law. But in general they seem to get along well and the Queen seems to be leaving the up-bringing of Christian (and the other two grand-sons) up to their parents. So, I doubt there is any real sort of conflict there. I had read someone on this site that QMII was upset with the way that Mary planned the christening...some row about colors and flower selection. From what I read (can't remember where or who posted), they were miffed...true, don't know. I think Queen Margrethe and Crown Princess Mary have a very normal in-law relationship. I would guess they mostly get along but I'm sure sometimes they may not always agree and that's when Frederick may become the go-between. There has been nothin about that in the Danish, or orther medias, that I have seen. And they are not likely to ignore such a rumor, are they? Yes, I heard that too that the Queen wanted either different color flowers for the christening or different flowers. Something to that affect. I'm sure it is not easy for Mary. I mean, some of her and Fred's vacations are spent with his parents. I don't know if I could do that year in and year out, as well as the Christmas holiday. But, Mary has given up much of her freedom, but that was her choice so she obviously thought she could handle it or at least because of her love for Fred. I would add, too, that I think the Queen has been pretty open and flexible to changes on Mary's behalf in how she goes about her role as Crown Princess, whether they were initiated by Mary or not, I don't know, but some of the things Mary has done couldn't have occured without consent of the Queen. For example, at the beginning of the year Mary held her own New Year's ceremony for her patronages rather than attend one with the Queen, Henrik and Frederik for their patronages. At the time there was a lot of ink spilt about Mary going against tradition but also praise about Mary doing something unique as CP and modernizing things and that surely she wouldn't have forged ahead with her own gathering without approval by the Queen. :o I think they have pretty good relationship. But it has been Magrethes arena for quite some time....might have difficulty handing the reigns over once in a while? i would agree with posts but HM Queen wanted help Mary for planning christening of their baby son Christian but Mary wanted handles on their planning than mother-in-law i would understand of Mary what she wanted it. but she bring baby christian to trips without knowledges but im sure Mary wanted be as 100% caring baby than nanny like any royals mothers wanted to care of baby when parents was away and who cares of Christian but she wanted kept baby than no helping with in-laws but i dont blame Mary because she is mother and she can give her baby as breastfeed when gone to trips. I think all families have their up and down times. Most of the time things will be fine. Royal families are like no other, except for the titles, the crowns, tiaras and palaces. If you can't present any evidence that this is true I think this line of speculation should be removed.